To those of us in the Pacific Northwest, blackberries may seem beyond resilient, more pest than welcome guest in the garden, popping up unbidden. Resilient the canes may be, but even so they are susceptible to diseases, including several agrobacterium diseases of blackberries that result in galls. Why do blackberries with agrobacterium diseases have galls and how can blackberry agrobacterium diseases be managed? There are a few agrobacterium diseases of blackberries: cane gall, crown gall and hairy root. All are bacterial infections that enter the plant through wounds and create galls or tumors on either the canes, crowns or roots. Cane gall is caused by the bacteria Agrobacterium rubi, crown gall by A. tumefaciens, and hairy root by A. rhizogenes. Both cane and crown galls may afflict other bramble species. Cane galls occur most commonly in the late spring or early summer on fruiting canes. They are long swellings that split the cane lengthwise. Crown galls are warty growths found at the base of the cane or on the roots. Both cane and crown galls on blackberries become hard and woody and dark in color as they age. Hairy root appears as small, wiry roots that grow either alone or in groups from the main root or the base of the stem. 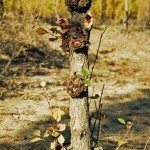 While the galls look unsightly, it is what they do that makes them disastrous. 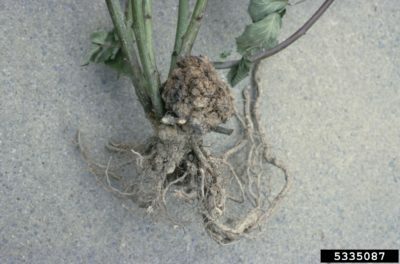 Galls interfere with water and nutritional flow in the vascular system of plants, seriously weakening or stunting the brambles and rendering them unproductive. Galls are the result of bacteria entering into wounds on the blackberry. The bacteria is carried either by infected stock or is already present in the soil. Symptoms may not appear for over a year if the infection occurs when temperatures are below 59 F. (15 C.). There are no chemical controls for the eradication of agrobacteria. It is important to examine canes prior to planting for any evidence of galls or hairy root. Only plant nursery stock that is free of galls and do not plant in an area of the garden where crown gall has occurred unless a non-host crop has been grown in the area for 2 plus years. Solarization may help kill bacteria in soil. Place clear plastic on tilled, watered soil from late summer to early fall. Also, be gentle with the canes when training, pruning or working around them to avoid any injury that will act as a portal to bacteria. Only prune the canes during dry weather and sanitize pruning equipment both before and after use. If only a few plants are affected, remove them immediately and destroy them. Commercial growers use a non-pathogenetic bacterium, Agrobacterium radiobacter strain 84, to biologically control crown gall. It is applied to the roots of healthy plants just before they are planted. Once planted, the control becomes established in the soil surrounding the root system, protecting the plant from the bacteria.